How To Find Your Entire Google Voice Search HistoryShould I Call It Google’s Alphabet Or Alphabet’s Google?Using Google Photos From The DesktopGoogle + Levi Strauss = Smart Clothes? 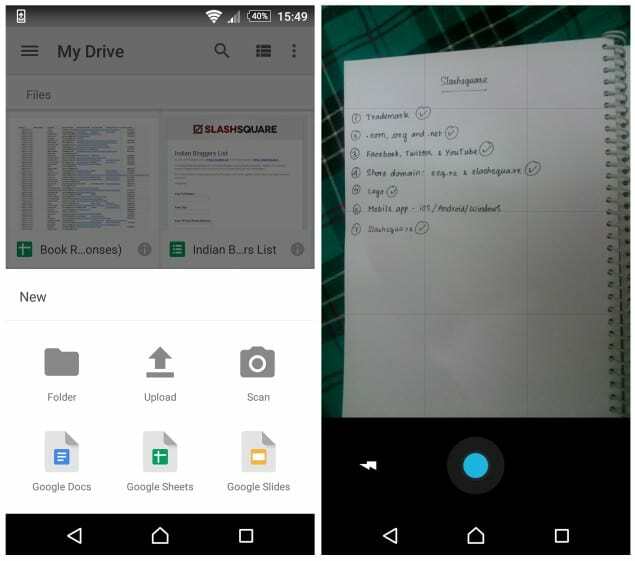 Earlier we shared an article about scanning documents and whiteboards using your smartphone, but we used Microsoft’s Office Lens app for that, and now we have this post, which tells you how you can use your Google Drive app to easily scan documents. You can scan and upload them to your Google Drive account itself. Pretty comfy it is. I usually use Google Drive and Dropbox for taking backups of important documents. But, since Google Drive is automatically connected with my all Google Apps account, I use it frequently. Open your Google Drive app and you’ll see a red circled ‘+’ icon at the bottom right of your screen. Click it. Now you’ll get a popup panel (at the bottom) with various options, choose ‘Scan’ and your device’s rear camera will be activated. You can use this to scan (or take photograph of) your desired documents. 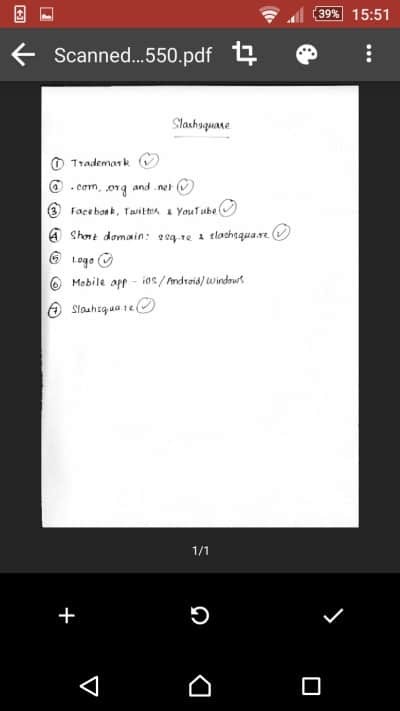 I took our Slashsquare’s basic checklist for this scanning demo. Just keep your hands steady and take a proper picture. After taking the picture, you can rotate it or you can even crop it according to your desired size. That’s it. You have successfully scanned your document using your Google Drive app. This will be automatically uploaded to your Google Drive account and saves you time. I tried the same with some other pictures and newspaper clippings as well, came out very well. Pretty simple isn’t it. Most of us regularly use Google Drive app, but we don’t really understand (or want to understand) its full functionality and features. I really love the way we can use our smartphone’s camera. We can do a lot more than taking selfies you know. Have you tried this Google Drive app tip? Having any queries regarding this? Do let us know your views in the comments below.